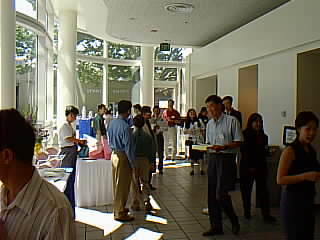 The Second Annual VACETS Technical International Conference (VTIC'97) took place in San Jose, U.S.A., from July 17 to July 19, 1997 at the San Jose State University. The conference was opened by Prof. Cao Huu Tri, Conference Chairman, Mr. Le Mong Thao, VACETS President, and Dr. Donald Kirk, Dean of the School of Engineering. Following the Opening Remarks, Dr. Le Trong Thuy, Vice-chair of Technical Program, explained the conference program, its format and objectives. The KeyNote Address was then delivered by Ms. Hoang Bich Lien, Executive Director at Bellcore. Ms. Hoang's speech on the topic of "How To Strive In An Environment Of Change" touched various important career issues that have a definite impact on engineers and scientists as employees of global corporations. This year's conference attracted many quality technical papers from Europe, Australia, Asia, and the United States. There were many excellent presentations during the meetings followed by lively discussions. The conference covered six topics: Computer Systems and Applications, Energy and Environment, Microelectronics, Telecommunications, Material and Manufacturing Technologies, and Biomedical. As expected from the conference theme "Key Technologies for the Year 2000," the Telecommunications and Biomedical sessions generated profound interest. Besides the formal sessions, there were two Panel Discussions on Information Technology In the Pacific Rim and Profile Of A High-Tech Worker In The 21st Century, two concurrent workshops on Network Management and FPGA Fast Prototyping, and a workshop on the Internet. Also part of the conference was an excellent banquet attended by about a hundred guests with the special presence of Dr. Peter Lee, Associate Vice President of San Jose State University, and the Honorable Thang Nguyen Barrett, Judge of Municipal Court. After Prof. Cao Huu Tri and Dr. Nguyen Huu Xuong (UCSD) gave their quick Welcoming Remarks, Dr. Lee delivered an emotional speech on several issues dealing with the integration of Asian immigrants into the American society and the must for unity. Dr. Nguyen Tien Luc, VACETS new president, followed with the upbeat presentation of his vision for VACETS. Mr. Trung Dung's, Chief Technology Officer of OnDisplay, then lead the audience through the journey of a start-up company in Silicon Valley, followed by Judge Nguyen's speech on the challenges facing Vietnamese professionals in every walk of life. Other highlights included the presentation of the Student Paper Award to Ms. Nguyen Thuy Linh, Ph.D. candidate from Canberra, Australia, a colorful Vietnamese traditional dance performance by the Wings-Of-100-Viet, and piano entertainment througout the evening provided by Mr. Le Hiep. The conference ended on Saturday with a post-conference tour of the beautiful Monterey Bay in the afternoon and a funfilled evening party at the private residence of Dr. Le Huu Phu, Public Relation Chair. The overall assessment is that the conference was a success, but not without a few pitfalls that definitely could be improved in the next conference. The publication acceptance rate was good with thirty eight over forty four papers accepted for presentation and publication. The attendance met the Organizing Committee's goal and expectation of about a hundred and twenty people, with approximately sixty people on the first day and an average of thirty to forty people for each of the next two days, spreaded throughout different sessions. There was initially a regrettable misunderstanding between the Organizing Committee and the local Vietnamese community representatives with respect to the conference objective, but it was resolved in good faith after the local community leaders and the local press attended the Opening Session and the following days. The advantage of this year's conference was that it was co-sponsored by San Jose State University and VACETS which contributed a good part to covering the required expenses. Significant fundings also came from private corporations including IBM, Solectron, Heat Pipe Technology, SmithKline Beecham, Next Level Communications, VLSI Technologies, Mars 21 Inc., OnDisplay, Mitta Technology Group, and several local sponsors. Due to lack of preparation and experience in the exhibition task, the conference only provided (ten) unattended exhibition tables for its sponsors and could not accommodate additional ones that requested late.